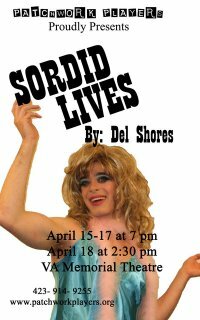 Don't miss "Sordid Lives" this weekend April 15-18 at the VA Memorial Theater! PSFers (Presbyterian Student Fellowship) Sam Floyd and Caitlyn Morelock are just sordid enough to be in it! The Patchwork Players, a student theater organization at East Tennessee State University, will present the adult comedy “Sordid Lives” at the VA Memorial Theatre April 15-18, with Thursday, Friday, and Saturday evening performances at 7 p.m. and 2:30 p.m. on Sunday. Written by Del Shores, “Sordid Lives” debuted as a stage play in 1996 and was later produced as an independent film in 2000 and eventually as a television series. The show tells the story of a Texas family dealing with the death of the elderly matriarch. There is no admission fee, but donations to the Patchwork Players will be accepted. For tickets, more information, or to request special accommodations, call (423) 631-2184. I know Del Shores. He is a wonderful talent. All will be moved if they see "Sordid Lives." It is very, very funny :) Enjoy ! And I am Del Shores and am so happy a college is doing my play! Have fun! @T&M All right! Hey I am coming out to MT end of July. Hope to see you. Sam (pictured) is one of our PSFers. He says it is going to be great. Wonder if Parker Williamson will attend?